I’ve always loved prereleases and, ever since my first one in Lorwyn I’ve only ever missed one. And every single time I’ve paired up with a friend in at least one 2-Headed Giant flight on prerelease weekend. 2HG is a completely different beast than solo magic. Just like every other event where you’re part of a team you get to discuss your options when they matter, revel in your shared victories, and support each other while you tell your bad-beats stories to anyone who’ll listen. 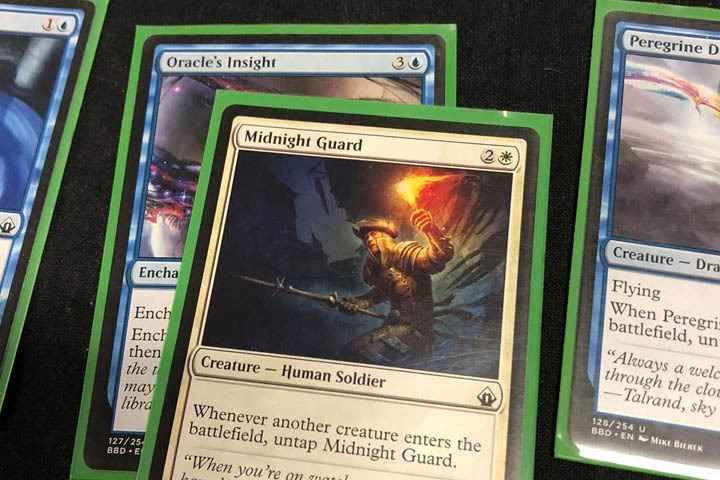 This past weekend was the prerelease (aka “preview event”) for Battlebond – a set designed entirely for 2HG. Of course, I signed up for as many flights as I could, forming two teams over the weekend. Bonnie & Clyde with Ciaran and The Battlebuds with my partner, Bek. Our results varied over the course of the weekend but, like any team event, we came out of it with our share of stories. 2HG is a great format. Matches are played as a best-of-one since Games typically last much longer than single events due to the extra life (30 instead of 20) and the additional communication. Because it’s harder to aggro your opponents out, the games can end up becoming “battlecruiser” Magic. You get to “go big” and play huge monsters costing 6+ mana. You get to assemble whacky combos you have no business assembling. In short, you get to do a lot of fun stuff often reserved for the Kitchen Table. Battlebond is no exception and it adds so much more to the 2HG format. One of the frustrations with 2HG in a regular format is that it’s not uncommon for one player to suffer mana-screw or flood, or simply not have enough threats to play. 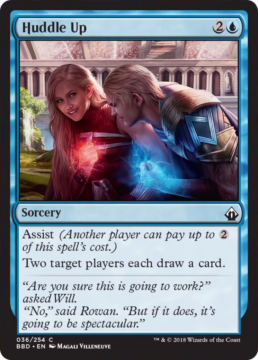 Wizards have done a great job mitigating this with Battlebond by having plenty of cards with symmetrical effects for drawing cards or getting lands like Soaring Show-Off and Veteran Explorer. 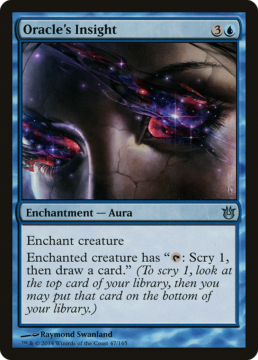 There are also a heap more cards that allow you to target other players to draw cards like Painful Lesson and, one of my favourite reprints in this set, Reckless Scholar. Battlebond also introduces a couple of new mechanics which do their part in preventing 2HG feelbads – Assist and Partners With. Assist is incredible. It lets teammates who don’t have anything to play contribute to the team and gives teammates who are short on mana the ability to still play their cards. It prevents your team falling to far behind simply because a head stumbles on resources. Two of my favourite assist cards to play this weekend were Huddle Up and . 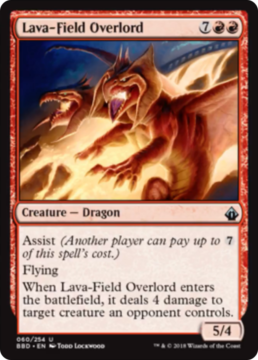 Lava-Field Overlord, which are completely opposite in what they do and really shows the power of assist. Huddle Up lets you spend your team’s excess mana and dig for some more plays while the Overlord is a giant flying 2-for-1 monster that costs NINE MANA and is a spell you’d never cast in most other formats. 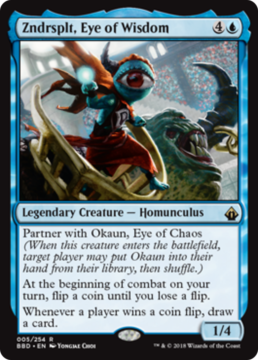 Partners With is the flagship mechanic of this set and is great to play with. It’s as powerful as it is flavourful. Not only do the partners essentially draw your team a card, but they all synergise incredibly well – albeit sometimes too well! 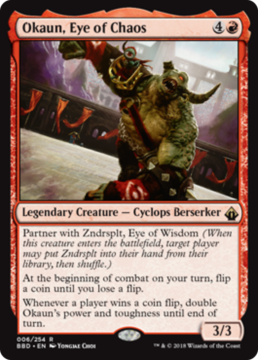 We had one team draw about 20 cards of the coin-flipping twins Zndrsplt and Okaun. They ended up drawing an entire deck, depriving them of victory on the turn they intended to swing for lethal! Below are two of the decks The Battlebuds played with over the weekend that we had a blast with. As you can see, these decks aren’t particularly aggressive – both decks have multiple cards that cost seven or more mana! Aggro decks don’t typically have much of an impact in 2HG and, with only six packs for your whole team, you’re probably not going to have the density of cheap and evasive threats you need to quickly kill the opposing team. Without aggro decks running around, though, you get to have a bit more fun – plan some absurd combos, play your huge creatures and deal with huge boards where you get to do a ton of math. The white blue deck here had the great combo of Midnight Guard and Oracle’s Insight to scry and draw multiple cards a turn. With the addition of Blaring Recruiter this made quite the delightful engine. 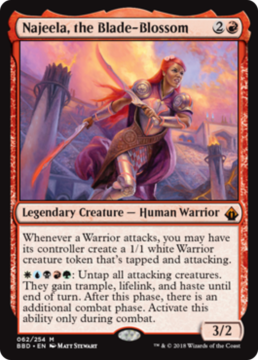 In the other deck we continue our Warrior tribal sub-theme with Blaring Captain, the partner of the Recruiter, and the spicy Najeela, the Blade-Blossom. We even got a bit greedy but couldn’t resist running the extra lands required to pay for the mythic’s swingy ability, just in case. Previous Previous post: P1P1 Battlebond is up! Get picking! Draftaholics Anonymous is not affiliated with, endorsed, sponsored, or specifically approved by Wizards of the Coast LLC. We may use the trademarks and other intellectual property of Wizards of the Coast LLC, which is permitted under Wizards' Fan Site Policy. Buy us a pack for our next draft! with our new tools, upcoming events and other news!